A board certified emergency medicine physician and flight physician with 30 years of Air Ambulance transport experience leads our medical flight crews. 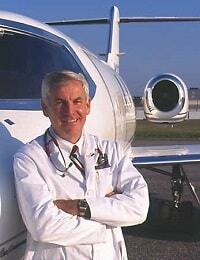 He also advises on day-to-day operations and reviews patient conditions on necessary transports. This allows for medical direction and consultation to any of our air ambulances with 24-hour availability. In addition to the superior in-flight medical training he requires for the selected flight crews, he institutes a very personal, compassionate culture to ensure each patient and their families experience a comfortable and compassionate air ambulance flight. Flight crews typically consist of a flight physiology certified RN and Respiratory Therapist. 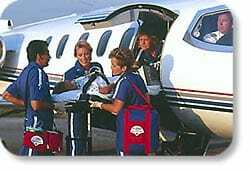 In cases where the patient requires higher medical care AirMD will select a flight physician to accompany the transport. In situation where the patient is stable, a cost effective alternative would replace the respiratory therapist with a flight paramedic. All flight crew personnel under annual flight physiology training, emergency evacuation training, HIPPA awareness training, background checks and drug tests. The patient’s medical care is our primary concern in all transports. All lead pilots have a minimum of 2,500 total flight hours experience with 1,000 of those hours in multi-engine. All pilots receive on-going professional training by FAA approved check airmen and/ or on flight simulators. They must pass a flight physical every 6 months and annual background / drug tests. Learn more about our Air Ambulance Fleet Options. *Air MD arranges and utilizes the services of affiliated partners who hold a certified FAA Part 135 air carrier certificate to provide non-emergency air medical transportation services. Air MD is solely an “Indirect Air Carrier” and does not retain economic authority conferred by the Civil Aeronautics Board under the 14 C.F.R. Part 135 regulations. Air MD does not perform, retain or execute any form of operational control in accordance with the FAA F.A. R. 14 C.F. Part 135 Regulations.